Found at the local Good Will. The bottom is textured, which makes it an interesting piece for collectors I suppose, since all of the others I have seen have a smooth bottom. Hmmmmm, maybe I should have grabbed that one. 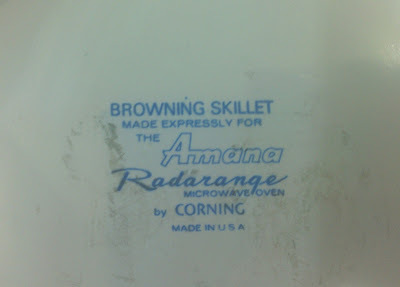 I had an Amana Radarange, and I have a browning skillet. Now I will have to go look what the browning skillet says on the bottom. ....dragging up almost 2 year-old posts again. So there's a P series and an A series skillet out there, and I've seen menuette pieces on e-bay, any idea how many different pieces were made like this? I found a skillet yesterday with the wording above in black and a slightly different format so I hope you get an answer Tom. Just scored the Litton skillet w/ the handle! So great to be able to find info. on it here. 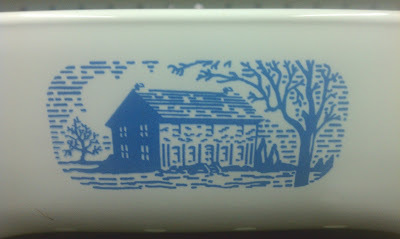 I have a browning skillet (with the Colonial house), but it doesn't have any numbering anywhere. Has the "made for the Amana Radarange" in black on the bottom. Can't wait to use it today!! I have the browning skillet made expressly for the Amana Radaranger. Since I don't own a Radaranger can I use it in my Panasonic 1300w high power microwave? Yes, you may, Jackie. However, the cooking times will be shortened a little bit, due to the higher wattage of your microwave. 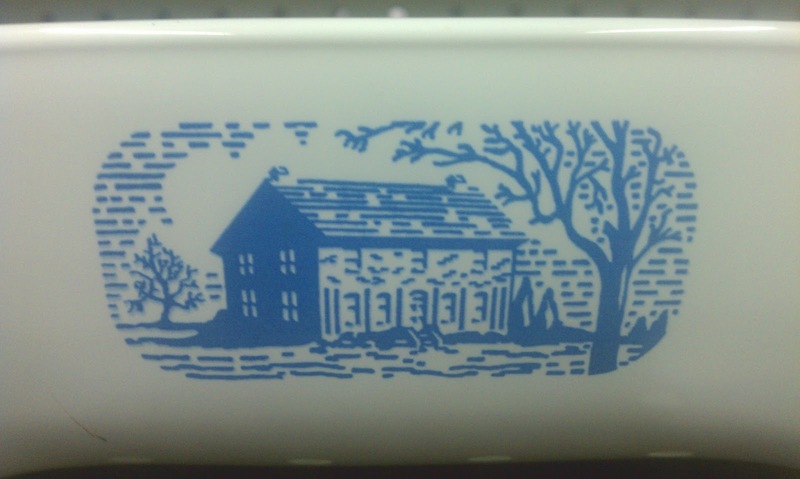 Corning made several "Patterns" for dfferent microwave manufacturers. There is the Amana pattern, the Sears pattern, the Montgomery Wards pattern as well as one for Norelco and several miscellaneous ones that were sold directly from Corning Glass Works. All of them will work the same, regardless of which microwave they are used in. These were all primarily manufactured to help sell microwaves.